By Nicholas Msowoya, A Correspondent. At the heart of Karonga town lies a small rickety shelter, known as “paseli” to mean “just behind”. Indeed, paseli is just behind a lineup of shops that stand guard to one of the busy roads to the east of the town’s only roundabout. Fraha Phiri: I have now built a big house for myself. The only time the shelter is bustling with life is in the morning, and there are no prizes for guessing the reason: it is a breakfast spot that has earned a reputation for its unique and simple dish known simply as supu ya nguvu, or supu for short. 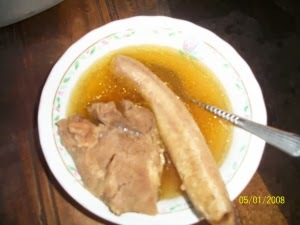 Supu ya nguvu is a Swahili coinage for “soup that gives strength.” This dish is made up of a large lump of boiled beef, its soup and a boiled banana. Apart from water and salt, there are no other additives, spices or ingredients added. If you expect it to be served with a cup of tea, you are in for a shocker because this dish comes along with a soft drink. That’s how unique or strange, if you will, supu is. Simple as it sounds, the dish has won the hearts many people who visit the district, as evidenced from the number of vehicles of all sizes and description that scamper for parking space around the far from sophisticated structure. Owner of the breakfast hotspot Fraha Phiri says she is very contented with her business as it has growing steadily over the years. 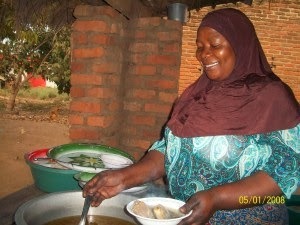 “I have now built a very good house for myself and I pay for my children’s school fees from the business,” she says. When one gets to Karonga, they can’t help it but salivate at this simple and natural mixture of water, salt, beef and bananas boiled under one roof, and on some occasions, in just one big pot.